There are certain films in the canon of American cinema that we should always leave room to remember and appreciate. These film can transport you to new worlds, give you new ways of looking at things, and then let you go after two hours or so to inspire you to spread the word and maybe create some stories of your own. Certain films can do that, and these films deserve the praise bestowed upon them; films like Star Wars, films like The Godfather… films like The Wizard of Oz. 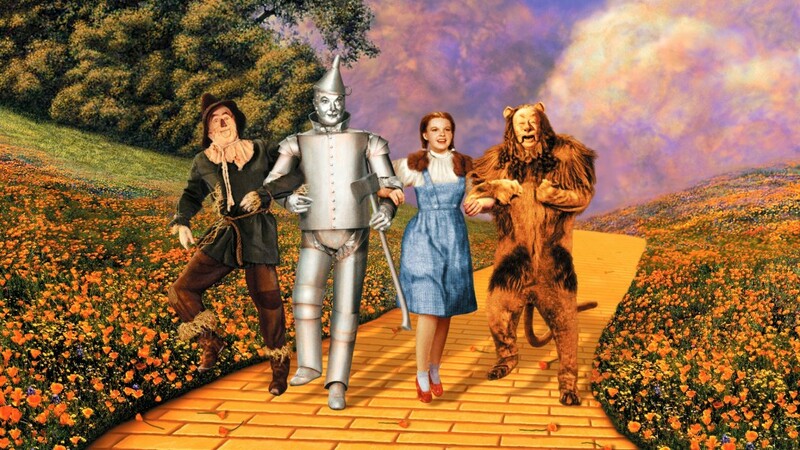 August 12th, 2014 marked the 75th anniversary of the original release of The Wizard of Oz, and though we’re a little late to the party, we here at The Young Folks see it absolutely fit to give proper praise to one of the most celebrated, most imitated, and most important films in American history. As if I need to even write a synopsis, Oz tells the story of Dorothy Gale and her little dog Toto, who live on a farm in Kansas with Dorothy’s Auntie Em and Uncle Henry. When a nasty neighbor tries to have Toto put down, Dorothy takes her dog away from the farm to run away. A tornado appears and carries her and Toto off to the magical Land of Oz, and upon arriving, Dorothy discovers that she has landed on the Wicked Witch of the East and freed the good people of Munchkin Land. She is praised as a hero and gifted with the witch’s magical ruby red slippers. While this new world of Oz is beautiful and entrancing, she has to return home, so she begins a journey to the mythical Emerald City where a great wizard lives, with the power to send her back to Kansas. Along the way she meets a Scarecrow who needs a brain, a Tin Man who wants a heart, and a Cowardly Lion who desperately needs courage. They all hope the Wizard of Oz will help them achieve their wishes, before the Wicked Witch of the West catches up with them. Regardless of whether or not you’ve seen the film, you know the story. This film has become so ingrained in American culture we can’t really escape it. That and it plays every Thanksgiving on TBS. The film was a landmark at the time for being one of the first films to utilize three-strip Technicolor, which gives the film its notably bright and wonderful aesthetic. Not only did the film innovate in this sense, it was also the first film to utilize this new technology and incorporate this coloring process into its narrative. The moment when Dorothy steps out of her drab Kansas farmhouse into the vibrant and lively Land of Oz still stands as one of the most awe-inspiring and beautifully rendered transitions in the history of film. The movie continues its visual spectacle and doesn’t let up for the remaining run-time, with intricately designed sets and costumes that fully immerse you in the fantastical land of Oz. The most impactful of all of these costumes and sets, however, is the one that might be the most simple: the gnarly green face and black dress of The Wicked Witch of the West, played with gleefully evil fervor by the wonderful Margaret Hamilton. My mother has regaled me, over and over again, with the story of the first time she watched this film, and she always speaks about one scene in particular: when the evil witch emerges from a cloud of smoke in the middle of the Munchkin city square to terrorize poor Dorothy. Even on a black and white television, this gnarly witch still managed to scare my mother from the front of the couch to behind it. Every performer in the film adds such a ridiculous amount of charm to their performance that you can’t help but fall in love with each of the characters. The not-so-dimwitted Scarecrow, the cold but warm-hearted Tin Man, and the regal but Cowardly Lion, are played with such finesse and skill by the equally brilliant Ray Bolger, Jack Haley, and Bert Lahr, respectively, and their performances are so perfect in showing how these three unusual but incredible characters grow to realize the potential they’ve carried all along. Wonderful subtlety in the midst of such a big, goofy movie (I use goofy in the most loving way possible). But at the center of this story is our heroine, Dorothy Gale, played with such sweet naiveté by the legendary Judy Garland. She rides the line between totally hammy and total under-reaction in every scene, but she manages to hold it together in a performance that launched her to the level of superstardom. She steals our hearts entirely in one scene, before she even makes it to the land of Oz. Dorothy is lamenting the life that she has in drab, sepia-toned Kansas, and in her barnyard sings one of the most hopeful and resonant songs of the 20th century, “Somewhere Over the Rainbow.” She imagines a land where all of her wishes will come true and the worries of yesterday are far behind her, and it’s a hope that we can all relate to. It’s a moment that totally transfixes you, and it doesn’t let go. The Wizard of Oz is a marvel in terms of technicality and performance, of course, but cut away all the special effects, all the songs, all the glitz, and you have a very simple story: finding where true power lies within yourself. The film has a universality to it in that way. Everyone is looking for answers to all of life’s hardest questions in other people, but at the end of the day, they find the answers within themselves, appreciating the people who helped them along the way. The film isn’t overly complex, nor does it bash you over the head with its symbolism. It simply guides you along through this wonderful new world, and honestly, I can’t see how someone couldn’t help but fall in love with it. It’s got that kind of charm that just makes you feel like you’re five years old again. That’s rare to find in a film, and that in itself should be celebrated. So, if you’re feeling it, shrug off some of that 21st century cynicism that we’re all carrying, sit down with your family, your friends, your dog, whomever, and just allow yourself to get lost in a land that exists somewhere over the rainbow. Sometimes we need it. James Gilbert is an eighteen year old college freshman currently living in York Beach, Maine.. He spends his time watching and studying films, reading books on the rare occasion that he can actually sit himself down to plow through one, or working on music. For the past year has been developing an instrumental project, prepped to be released in October along with a short film. He struggles with writing biographies. Twitter: @gamesjilbert, Tumblr: gamesjilbert.tumblr.com Soundcloud: soundcloud.com/gamesjilbert.